National Parks and Reserves are one of the Belarusian greatest landmarks that the locals are so proud of. Find out, what national parks in Belarus are really worth visiting! 1925 - Berezinsky - the first reserve established in the Byelorussian SSR. 1939 - on the territory that joined to the BSSR the Bialowieza Forest was created. 1969 - Pripyat National Park created. 1988 - Poleski National Park created. 1991 - Bialowieza Forest Reserve became a national park. 1995 - Braslav Lakes National Park created. 1996 - Pripyat Reserve was transformed into a Pripyat National Park (increased in area). 1999 - Naroch National Park created. 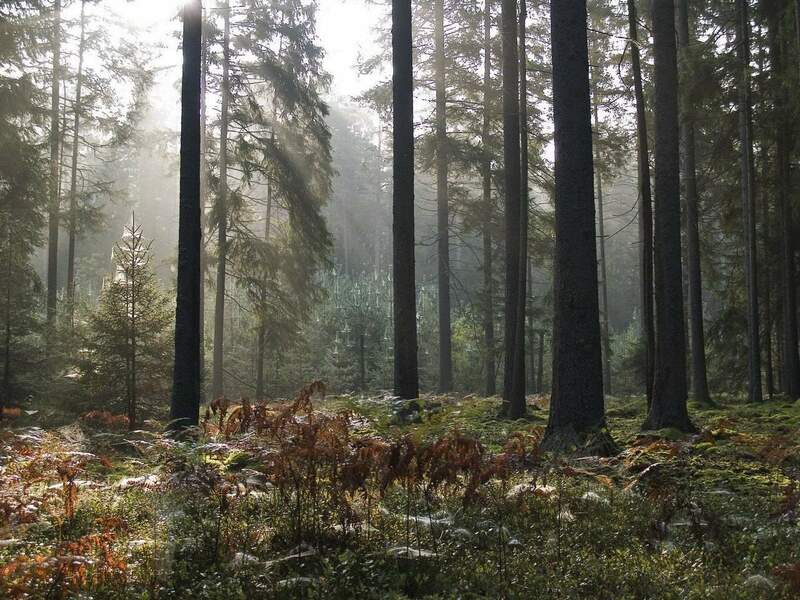 Undoubtedly, the most famous and largest national park is the "Bialowieza Forest", located in the Brest region. It is the largest remnant of the relic primeval lowland forest in Europe. 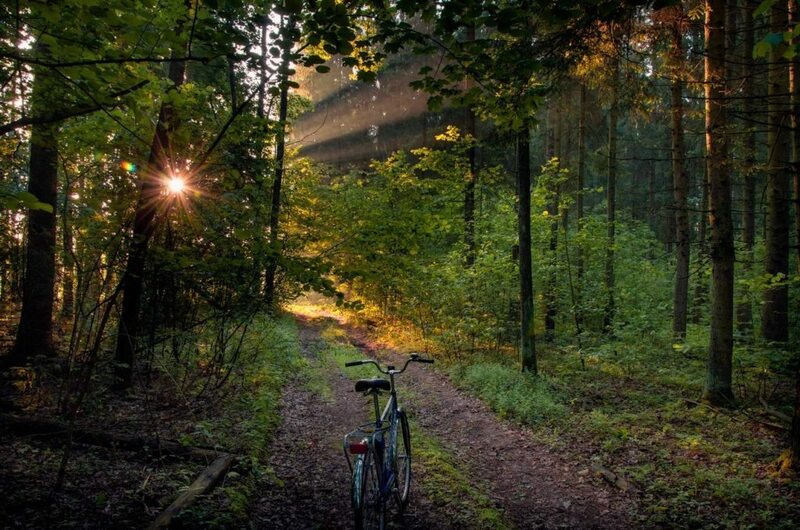 In 1992, UNESCO's decision was to include the State National Park "Bialowieza Forest" in the World Heritage List. Bialowieza Forest has a number of species of plants and animals unique in Europe. In this national park, there are hundreds of old oak trees, whose age is more than 500 years. Here you can meet and take a picture of the European Bison in his natural habitat. You can also find such rare birds as the black stork, white-tailed eagle, and the gray crane. Bialowieza Forest is interesting as an object of eco-tourism. You can get acquainted with the representatives of the local flora and fauna in the Museum of Nature, where the animals live in spacious open-air cages. You can admire the beauties of the national park while walking along one of the many hiking trails. Also, here is the residence of the Belarusian Santa Claus, which can be interesting to young visitors of the park. You can read more about this national park in our article. Berezinsky Biosphere Reserve is located in the northern part of Belarus at a distance of 120 kilometers from Minsk, on the border of Vitebsk and Minsk regions. Reserve Center is the Domzheritsy village in Lepel district. The reserve is part of a worldwide network of UNESCO Biosphere Reserves. The total area of it is 85.2 thousand hectares. Marshes in the park occupy most of the territory, thus making it unique among the other national parks. Here you can find all the known species of wetlands (about ten), and view them from a 15-meter tower. Tourists like to observe the surrounding territory from it. The reserve is home to many species of plants and animals, some of which are listed in the Red Book of the Republic of Belarus. There is a Nature Museum working in the Berezinsky Biosphere Reserve for more than 50 years having about 300 species of animals. The museum is open to visitors every day without a lunch break. The museum is located in the Domzheritsy village. You can see many animals, including elk, bison, bear, wolf and lynx very close by visiting the Forest Zoo. It is also worth to stroll along the ecological paths of the national park, visit rope town, order a horse ride or canoe tour, ride a bicycle along the routes of the park. Younger visitors also won't be bored, because the employees of the park organize naturalistic studies. 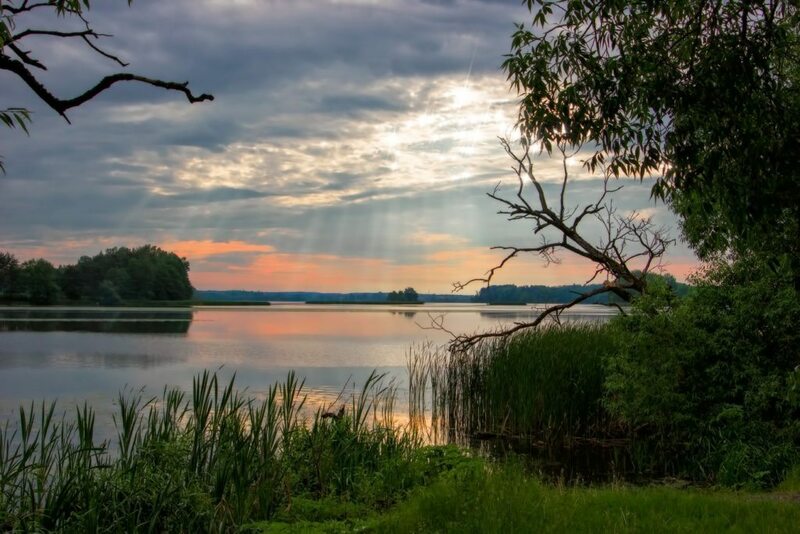 One of the most beautiful and unique places in Belarus is the Braslav Lakes National Park. 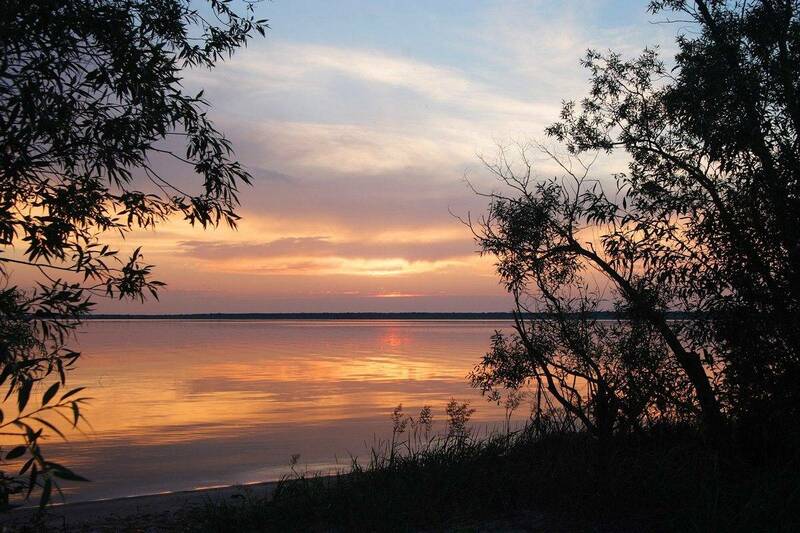 It is 250 kilometers away from Minsk, in the northwest part of the country. The composition of the park includes the southern part of Braslav region with significant wetland and forests. The total area of the national park is 71500 hectares, its length from north to south is 56 km, with 7 to 29 km wide. About 17% of its territory is covered by lakes, forests are 46% of the territory. You can find a number of interesting monuments of nature, history, and culture in the national park. They are glacial landforms, islands in the lakes, large boulders, ancient settlements, burial grounds and religious buildings, which attracts many hikers. The Braslav Lakes National Park carries out scientific activities as well as work on the protection of nature. Also popular are the excursions to the ancient town of Braslav, which is a research center of the park. 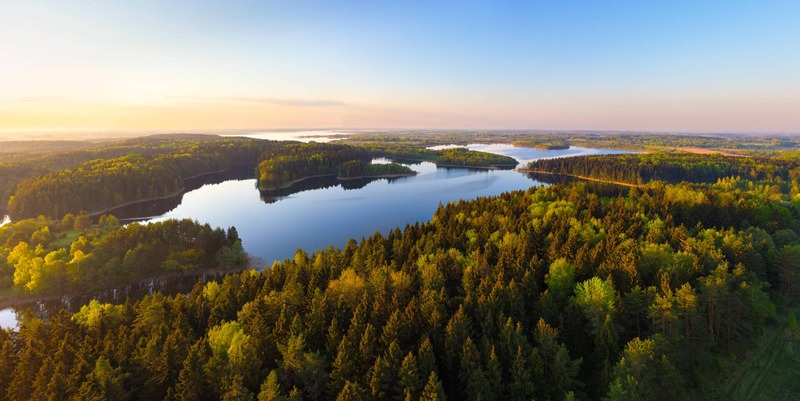 Braslav Lake District is referred to by many people as "the blue necklace" of Belarus and is a perfect place for eco-tourism. It is a paradise for lovers of fishing, hunting, and water recreation. In the most picturesque corners of this region, 48 tourist sites of different types and four recreation centers are located. They are "Drivyaty", "Zolovo", "Leoshki", "Slobodka". 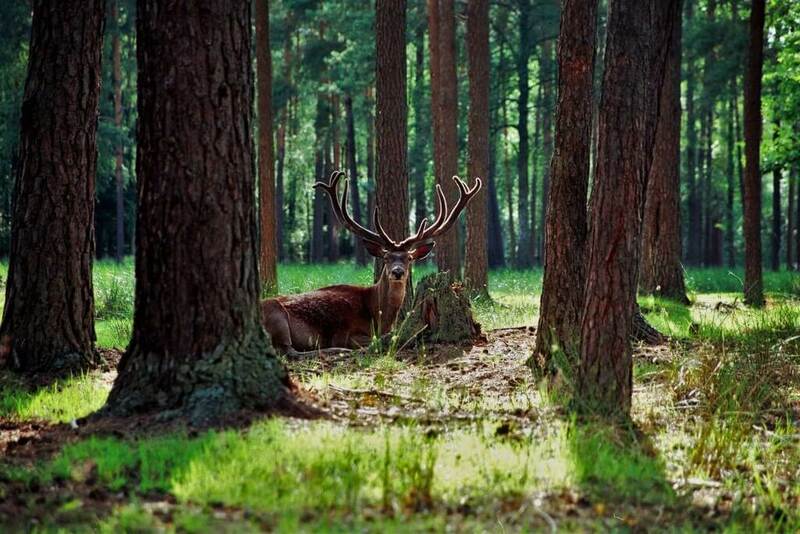 Naroch National Park is not far from Minsk and has an area of 97.3 thousand hectares. 17% of the park area is covered by lakes. In total, there are about 40 lakes surrounded by untouched forests with rare species of animals here. In the Naroch National Park, there are three groups of lakes: Bolduk, Naroch, and Myadel. 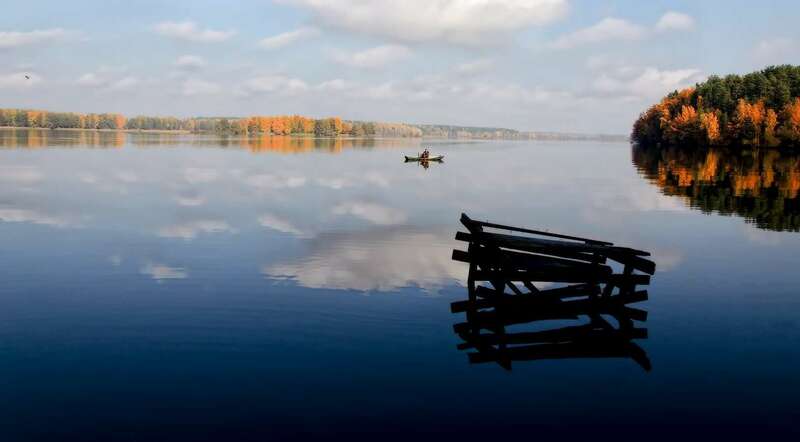 The central one is the Naroch Lake - the largest lake in Belarus (its area is 80 square km). The average depth of the lake is 9 m, length - 13 km, width 10 km. There are two dozen streams flowing into the lake, which then go into the Naroch river. The lake water is very clean, which allows breeding whitefish. This place is very popular with fishermen. The distinctive feature and uniqueness of the National Park are the biggest in Belarus resort and wellness area - the main health center of the country: there are about twenty sanatoriums built around the mineral water sources. The swimming season in the area is close to one hundred days a year. You can enjoy water rides, sailing on a boat or a catamaran. Hiking is also popular around the mounds and towns. In the center of the Polesie lowlands, there is an interesting geographical area on the south of Belarus. It is called Polesie Pripyat, spread on both sides of the Pripyat River. Pripyat Reserve is characterized by high wetlands, poorly developed territory, good preservation of natural complexes. The park preserved monuments of the Polesie inhabitants life, there is also a Nature Museum here that started operating in 1998. Here you can get acquainted with the historical, archaeological and cultural heritage, especially the life of the local population and rich nature of the Polesie Pripyat. In a picturesque corner of Polesie, everyone can relax among the natural landscapes and commune with nature The Pripyat National Park offers a walk through the ecological paths to the "king-oak" and "king-pine", a tour to the ancient town of Turov, the Church of Saints, a sailing tour on the Pripyat river. Polesie State Radiation and Ecology Reserve were established in 1988 in the Belarusian part of the exclusion zone on the territory of the three most affected by the Chernobyl disaster areas of the Gomel region - Bragin, Khoiniki, and Narovlya. Its area is 216,093 hectares. Currently, the reserve set checkpoint regime in order to prevent unauthorized stay. Although the reserve is created for the purpose of Radiobiology and Environmental Studies, it is of interest to biologists. Human intervention is minimal, so you can observe the development of the wildlife of Belarus in the natural conditions. It was our overview of all the national parks in Belarus. Each has something unique to make you want to visit it. Have a great trip!